Glenn Merten represents insurance carriers, financial institutions and other corporate clients in a wide range of matters, including complex litigation and class actions, administrative investigations, enforcement actions and compliance issues. Mr. Merten has extensive experience in litigation involving consumer fraud claims, alleged fiduciary breaches, suitability determinations, bad faith claims, sales practices issues, bankruptcy proceedings, claims of unfair trade practices, all manner of statutory and regulatory violations, and appellate proceedings. He also has substantial experience in employment litigation; life, health and disability disputes under ERISA; multidistrict consolidation proceedings; and negotiating and memorializing employment agreements. In addition to his litigation experience, Mr. Merten has guided clients through market conduct examinations, state attorney general investigations, civil investigative demands, Congressional subpoenas, and insurance department investigations. In addition, Mr. Merten has represented insurance companies in numerous administrative hearings involving customer complaints. He also counsels clients in connection with a variety of labor and employment issues, including employee handbooks, collective bargaining requirements, unfair labor practices, and trade secrets and restrictive covenants. Mr. Merten is a frequent author on a variety of topics, including class action developments, ERISA litigation, alternative dispute resolution, and recently has spoken about developments in lender-placed insurance litigation. 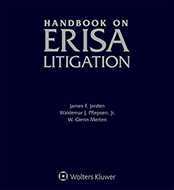 Handbook on ERISA Litigation cuts through complicated statutory provisions and tells you which ERISA claims are recognized by which courts and how to litigate them. Helpful litigation checklists and forms are provided on ERISA litigation as well as hundreds of citations to leading cases.